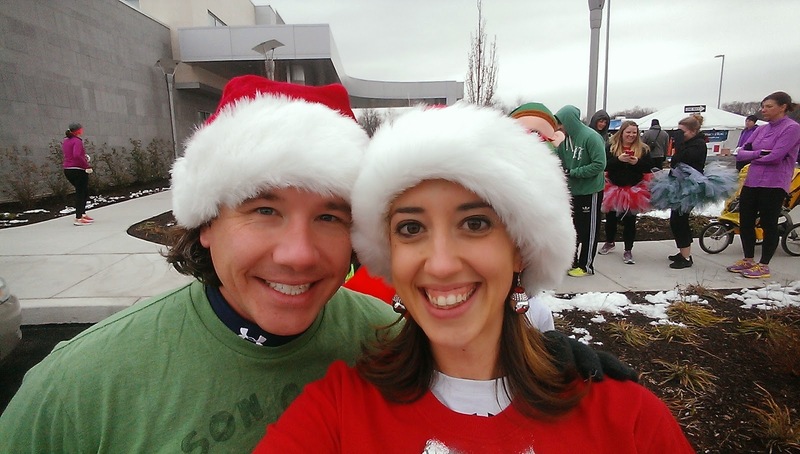 This past weekend, Matthew and I did the 2014 Jingle Bell Run/Walk in Harrisburg, PA. You might remember that we did this race last year and had a blast- lots of entertainment, lots of free food, and overall, just a well-organized and fun race. There had been some changes in sponsorship and venue this year. We arrived at 9:20 on Saturday morning for the 10:00 am race. We figured this would leave plenty of time to pick up our packets. We were wrong. There was a ridiculously slow-moving line for the folks who had pre-registered and absolutely no line for those who were signing up day-of. It sure made it seem like we should have just waited to register- there was no benefit to signing-up beforehand. Selfies in the never ending- and COLD- packet pick-up line! Once we finally got our packets- which included a really cute long-sleeved cotton t-shirt- there wasn't enough time to take our stuff back to the car. So, I asked the nice people at the Giant table (local grocery store) if they would watch our stuff while we ran. Luckily they said yes. At about 9:55, we lined up to start. As we were standing there, I heard someone behind me say, "Are you Sarah?" I turned around and saw Anne- a fellow #runchat-er from twitter! It was so great to meet her and congratulate her in person on completing her first marathon just a few weeks ago in Philadelphia. She is local to the area and was there running with a friend. We chatted for a few minutes as we got ready to start the race. Anne mentioned that some of the volunteers at packet pick-up were a little rude when they complained about the line being so long. Apparently packet pick-up opened at 7 am (for a 10 am race) and the volunteers basically chastised them for not coming earlier to get their stuff. Yeah, I think that's a bunch of crap. Head over to twitter to congratulate Marathoner Anne @annemasorti! The course itself was pretty boring- just a hilly out-and-back around a medical complex parking lot. We used 2:30/1 intervals- walking for the longer portions. Since I am still recovering from my stress fracture, I'm feeling out different intervals and speeds to see what keeps my foot pain at bay. When we started coming back towards the finish, Matthew and I noticed that runners who had already finished were walking back to their cars with cases of Turkey Hill (local convenience store) iced tea and lemonade. Before the race, they had been setting up a table, similar to Giant's, where they would be giving out drinks. Some of the runners were yelling to those of us still not finished, "Hurry up before the iced tea is gone!" Soon enough, we rounded the corner to the finish line. I looked at my phone- the course was exactly 3.00 miles; not the 3.1 miles it was advertised. Not a huge deal, but still, it's annoying when it's advertised as one distance but ends up being short. Matthew and I headed toward the Turkey Hill table- even though I could see that they were already packing up and getting ready to leave. We asked the guy there if there was any left and he said no. Keep in mind, this was only 40 minutes after the race started- there were still plenty of runners and walkers still out on the course. I don't know if the guy purposely gave away all the iced tea and lemonade because he wanted to leave early or if runners just took cases instead of one or two per person. Either way, the back of the pack got nothing. 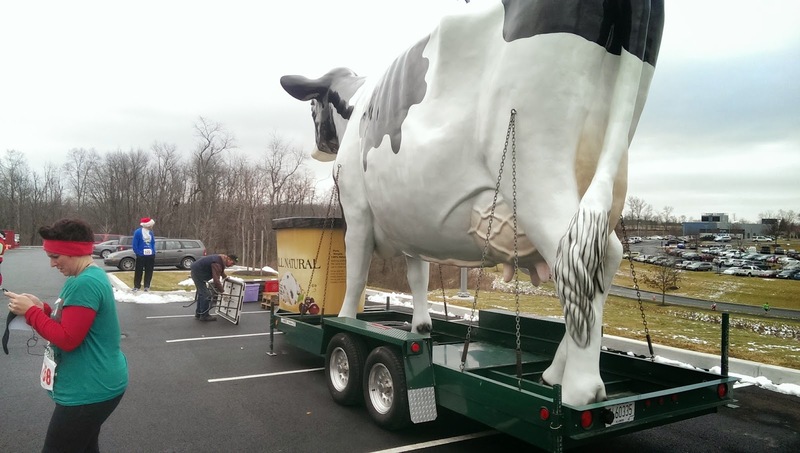 Nothing to see here, expect an empty table and a giant fake cow and ice cream carton. We made our way back over to the registration tents where Matthew thought he had seen some coffee and hot chocolate earlier in the morning. We eventually found empty coffee pots and "hot" chocolate made with cold water. There were some bananas and some packaged doughnut/coffee cake things so we grabbed a couple of those and then headed back to the car. So, in summation: long lines, rude volunteers, short course, no iced tea, cold hot chocolate. This race was a total opposite of last year's race. Now, I know that this is a race that benefits a charity and that the intent is not to pamper the runners. However, the reason we did this race again this year was because of how well-organized and fun last year's event was. And isn't that a good way to sustain money coming into your organization? Provide a quality event that keeps people coming back year after year? Unfortunately, we won't be back next year to do this race; it simply wasn't worth the entry fee. While I love the organization this race benefits, I'd much rather just make a donation than spend my money on a poorly executed event. 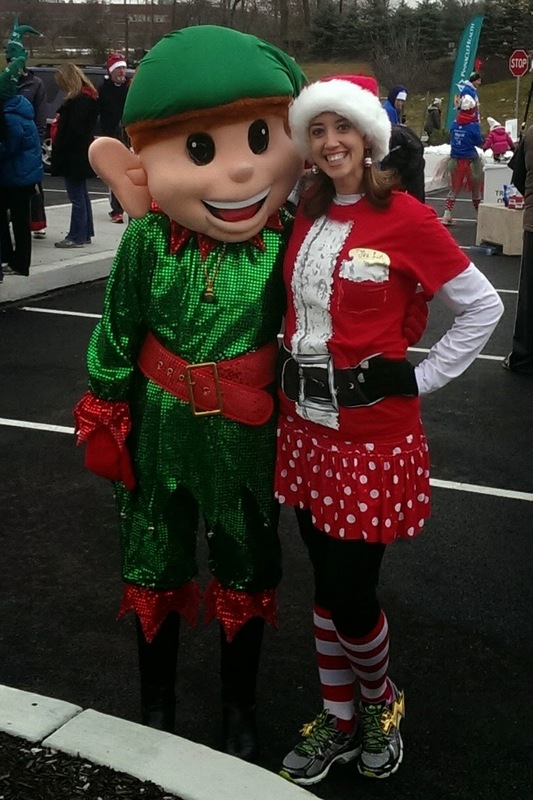 You know it's bad when Creepy Elf is a highlight of the event. QOTD: Have you ever made the decision to stop supporting a race? If so, why? I've been reading more and more recaps about food and drinks running out at races because other runners are taking way more than their fair share, I even saw something written by a race director about this. I did a half marathon in June in Philly (with only two gatorade stops on the whole course) where I was in the back of the pack and by the time I finished I got yelled at by a volunteer for taking ONE bottle of water and there was no fruit left, yet I saw plenty of runners walking around with bags full of fruit. Its really a shame that it seems like people are forgetting how to share... 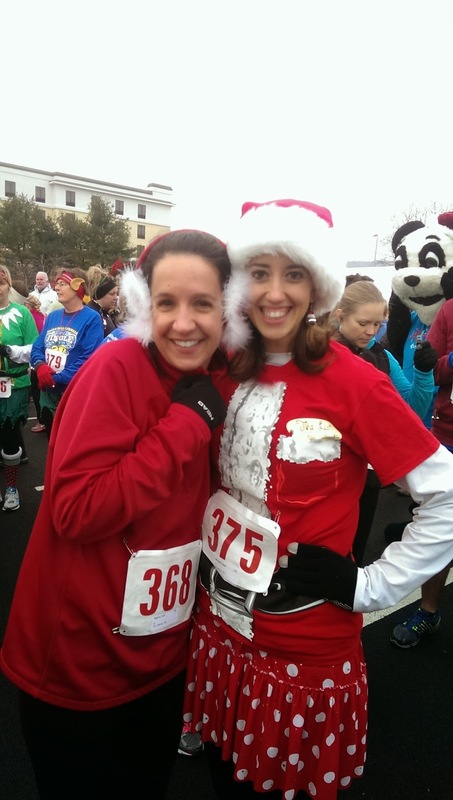 Especially at a holiday themed charity race!! EXACTLY! I'm not sure who the guilty party is here, but it was still pretty crappy to finish the race and then be turned away. It's just not good for business or the organization. Sorry to hear that the race didn't live up to your expectations, especially after having such a great experience last year. Hopefully the race organizers will appreciate the constructive feedback and make improvements for next year. I have seen some races that went from amazing and super fun to complete duds. While it is unfortunate that the charities may suffer, but you are so right - donate to a charity and feel good that way instead of the frustrations of a disorganized event. And I love your festive attire! I had a horrible experience at what I planned to be my very first race. This was the Never Quit Beach 5K at Jacksonville Beach. I wanted to have a race experience to get me ready for the Wine and Dine Half Marathon (which I now consider my one and only race since I don't count this one even though I finished). I ended up injuring my back two weeks before and spent 9 days in bed. I had paid $75 to register for this 5K, and it had been touted as the best 5K in the area. Instead of medals, they had finishing gifts that you selected when you registered. They supposedly offered free photos of you on the course and finishing and getting your finishing gift. There was supposed to be tons of free food. Well, I could barely walk, but I decided to walk the 5K (I was hunched over in pain the whole time). I had to stand in line for two hours in the hot sun the day before to pick up my packet at the race site (an hour's drive for me each way). The next day at the race, they started late, they had no food, and when I hobbled across the finish line an hour after I started, they told me that they were all out of the necklace I selected as my finishing prize, even though I per-ordered it. Also, they did not do the free pictures. One funny thing--our bibs were supposed to be personalized with who we will "Never Quit" for, which we indicated at registration. Mine was supposed to say "Homeless Pets". When I got my bib, it said, "My Kids" (I don't have kids). The person next to me in line said, "Mine says that I'll never quit for Kevin. Who the hell is Kevin?!". It was all very disorganized, and for such an expensive registration fee (that did NOT go to charity), I expected it to be great. The sponsor of the race tried to carry out the event themselves rather than using the organization that they had in previous years. When people complained on their Facebook page, all of the negative comments were deleted. I took comfort in the fact that no race could possibly be more disorganized and every race I experience in the future will be great by comparison!